Even though Adele flubbed during her live performance at the Grammys, she walked away the belle of the ball: She took home five awards Sunday night, including album, record and song of the year. She beat Beyonce in the top three categories with her comeback album “25,” and repeated her accomplishments from 2012, when the British star also won album, song and record of the year at the Grammys. She used her speech to honor Beyonce and her groundbreaking “Lemonade” album, which was also nominated. 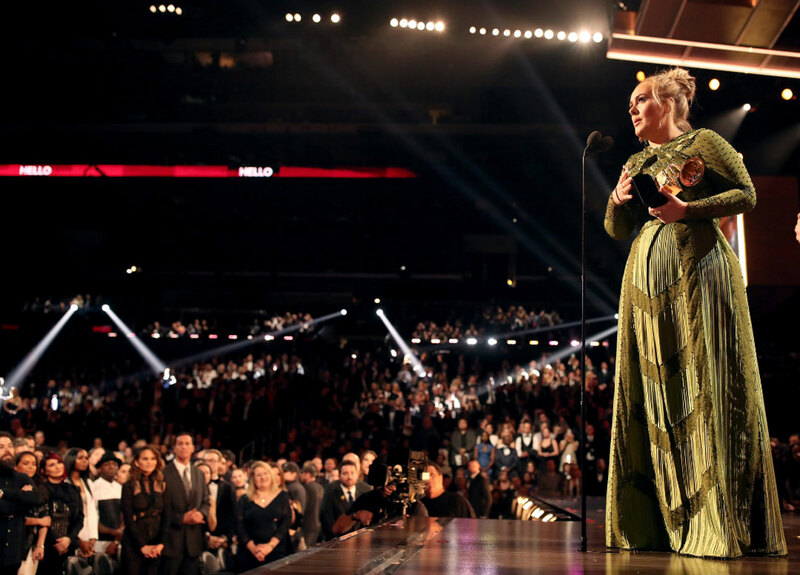 “The way you make my friends feel, the way you make my black friends feel is empowering,” Adele said at the Staples Center in Los Angeles when accepting album of the year. The night for Adele wasn’t all good though: The singer, who had trouble with her live performance at last year’s Grammys, asked to restart her tribute to George Michael, telling the audience: “I can’t mess this up for him.” She stopped and used an expletive after singing some of a new arrangement of Michael’s “Fastlove,” as videos and photos of Michael played in the background. She re-sang the song and earned applause and support from the crowd, though Adele was teary eyed. Michael died on Christmas Day. At last year’s show, the British singer had a hiccup after a microphone inside a piano fell onto the instrument’s strings. “Make some noise for Prince y’all,” Mars yelled. Mars was also a winner Sunday – he won for his producing work on Adele’s album. Adele’s other wins included best pop vocal album and pop solo performance. Beyonce sang on top of a long table, even leaning back on a chair while singing “Love Drought.” She later sang “Sandcastles” while sitting down in a chair that tilted alarmingly backward, hitting high notes. She earned a loud applause from the audience, including daughter Blue Ivy and husband Jay Z. Beyonce, who walked into the show with nine nominations, won two: best music video (“Formation”) and urban contemporary album (“Lemonade”). Beyonce’s speech wasn’t the only political moment: A Tribe Called Quest, along with Anderson .Paak and Busta Rhymes, gave a rousing performance and shouted “resist, resist” at their end of the performance, which featured a number of people onstage, including women in hijabs. David Bowie, who died last year from cancer, won all four awards he was nominated for. “Blackstar,” his final album released days after he died, won best alternative music album and engineered album, non-classical (Bowie is listed as one of the engineers on “Blackstar.”) In the latter category, he beat out Prince, who also died last year. The title track won best rock song and rock performance. Adele and Mars worked overtime onstage, performing twice. Adele kicked off the show with “Hello” and Mars and his groovy band gave a memorable performance of “That’s What I Like” – as Jennifer Lopez, Faith Hill, Rihanna and even some of the men in the audience watched closely, looking impressed. Chance the Rapper won the first award in the live telecast for best new artist. He also won best rap album – the first streaming-only album to do so – and bested Drake and Kanye West. “I didn’t think we were gonna get this one,” said Chance, who also won best rap performance. Twenty one pilots won best pop duo/group performance for the hit “Stressed Out.” They removed their pants when accepting the award in homage to their earlier days when they watched the Grammys at home in their boxers. The country music rebel thanked his wife, who he said told him to quit his job on the railroad years ago and move to Nashville. Joey + Rory won best roots gospel album for “Hymns,” and Rory Feek was emotional onstage as he remembered his wife Joey, who died last year from cancer. Some actors won Grammys, too: Don Cheadle picked up best compilation soundtrack for visual media for “Miles Ahead,” where he is credited as a compilation producer, and Carol Burnett won the best spoken word album Grammy. “The Color Purple” won best musical theater album, giving Jennifer Hudson her second Grammy and earning Tony winner Cynthia Erivo and “Orange Is the New Black” actress Danielle Brooks their first Grammys.